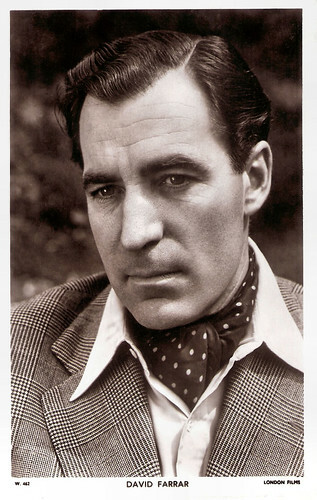 English stage and film actor David Farrar (1908-1995) with his dark and rather sinister good looks gained fame in the 1940s playing Sexton Blake in a pair of low-budget thrillers. Three of his most notable film roles were leads in the Powell and Pressburger films Black Narcissus (1947), The Small Back Room (1949) and Gone to Earth (1950). British postcard in the Picturegoer Series, London, no. W 179. Photo: Warner. British postcard in the Picturegoer Series, no. W 462. Photo: London Films. David Farrar was born in 1908 in Forest Gate, East London. At 12, he had his first stage role in A Midsummer Night's Dream by William Shakespeare. He dropped out of school at 14. He began his career with a stint at journalism at the Morning Advertiser newspaper. Then he started to act on stage. He met his wife, Irene Elliot, in 1926 when he was playing the title role on stage in David Copperfield. They married in 1929. In 1930 he took over the lead in The Wandering Jew in the West End, bringing notices that immediately established him as one of the most promising young leading men in the West End. With his wife he ran a repertory company until he entered films in 1937. In the enjoyable adventure tale Sexton Blake and the Hooded Terror (George King, 1938) he was Granite Grant, an agent on the track of the crime organisation Black Quorum. He had big parts in Quota Quickies and small parts in big films like Went the Day Well? (Alberto Cavalcanti, 1942). 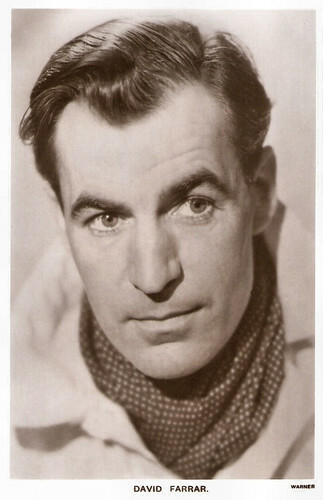 He starred in Ealing's semi-documentary about the Air-Sea Rescue Service, For Those in Peril (Charles Crichton, 1944). 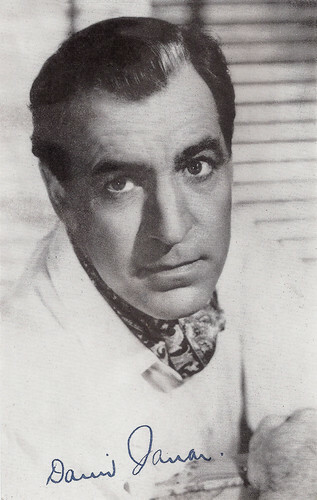 Farrar then played Sexton Blake twice in the low-budget thrillers Meet Sexton Blake (John Harlow, 1944) and The Echo Murders (John Harlow, 1945), which were enormously popular. By 1945 he was receiving 800 fan letters a week. He also made several poor films at British National, including Lisbon Story (Paul L.Stein, 1946). In the classic Black Narcissus (Michael Powell, Emeric Pressburger, 1947), he played the district agent who - clothed only in khaki shorts - stirs up sexual tensions in a Himalayan convent. Black Narcissus achieved acclaim for its pioneering technical mastery and shocked audiences at the time of release with its vibrant colour and the themes of the film. The film won two Oscars. For the writer-producer-director team of Michael Powell and Emeric Pressburger he also played the lame bomb-disposal expert in The Small Back Room (Michael Powell, Emeric Pressburger, 1948) and the swaggering squire in Gone to Earth (Michael Powell, Emeric Pressburger, 1950) with Jennifer Jones. He also starred for Ealing in Frieda (Basil Dearden, 1947) as the officer who brings home a German wife (Mai Zetterling), and Cage of Gold (Basil Dearden, 1950) opposite Jean Simmons. In Cage of Gold, he had argued successfully with the producer Michael Balcon that he be allowed to play the villain rather than the less colourful hero. 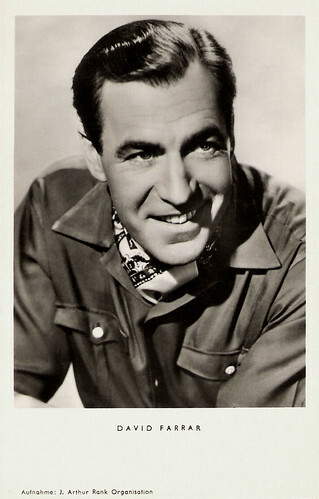 In 1949 exhibitors voted him the ninth-most popular British star. West-German postcard by Kunst und Bild, Berlin, no. A 197. Photo: J. Arthur Rank Organisation. British postcard in the Celebrity Autographs Series, no. 134. Photo: Republic. Publicity still for Lilacs in the Spring (Herbert Wilcox, 1954). David Farrar’s brooding good looks and deep, rich baritone won him legions of female fans in Europe and also in the USA. Hollywood came a-calling and he moved to the Universal studios where he became a contract player. And although he enjoyed the money, glamour and star treatment, his Hollywood adventure declined his career into supporting and mainly villainous roles in undistinguished adventure and costume pictures, such as The Golden Horde (George Sherman, 1951) with Ann Blyth, and The Black Shield of Falworth (Rudolph Maté, 1954), starring Tony Curtis. After playing the Egyptian Pharaoh in Solomon and Sheba (King Vidor, 1959) featuring Yul Brynner and Gina Lollobrigida, he returned to England somewhat embittered by his Hollywood experience. He was determined to do better in his own country's film industry, but he couldn't regain the momentum he had before he left for Hollywood. His final films were the Irish production The Webster Boy (Don Chaffey, 1962) with Richard O’Sullivan, and the historical epic The 300 Spartans (Rudolph Maté, 1962) in which he played the small part as King Xerxes of Persia. 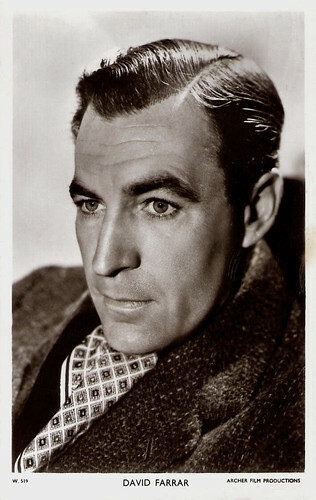 Farrar retired from the cinema in 1962 when he was just over 50. Brian McFarlane in Encyclopedia of British Film: “He retired unwilling to play 'the heroine's father' as he did in Beat Girl (Edmond T.Gréville, 1960), depriving British cinema of an interesting mix of sneering authority and sensitivity”. He went to work for television. After the death of his wife Irene in 1976, he moved to South Africa to be with their daughter, Barbara, and retired from acting. David Farrar died in 1995 in KwaZulu-Natal, South Africa, 10 days after his 87th birthday. British postcard in the Picturegoer Series, London, no. W 519. Photo: Archer Film Productions. Trailer Black Narcissus (1947). Source: ryy79 (YouTube). Sources: Tom Vallance (Independent), Brian McFarlane (Encyclopedia of British Film), Richard Lamparski (Powell-Pressburger.or), David Stout (The New York Times), Wikipedia, and IMDb. He was great in Black Narcissus.